There are two things I look for in clothes these days, coverage and layers. I can run hot and cold–you know the drill ladies. One minute I’m freezing, the next I’m on fire. Gotta love those hot flashes… Not! Anyway I’m getting smart in my old age. I have become a huge fan of the cape. I’ve actually become quite a cape collector. I have bright colors, solids and plaids. I feel chic in a cape, it covers the tummy quite nicely AND I can take it off if I get hot. Capes can be an inexpensive and easy-peasy way to jazz up an outfit too. This little cashmere number is actually called a “topper.” I love the gorgeous purple/blue color which is super flattering for most skin tones. I created this outfit by starting with a column of all black which is not only slimming, but also easy to pair with any color. This gray wool fringe cape is such a fun piece. It’s super cozy and easy to wear. Since it’s plenty roomy, I sometimes wear it over a leather jacket or bulky cardigan in leu of a coat. I found this one at a consignment shop. I’ve included links to some other capes I like that are under $50! A plaid cape is so classic. Last but not least, every woman needs a solid black cape that will go with just about everything. Well, time to “wrap it up”–corny I know, sorry. Stay cozy–it’s freezing in Boston! Susan Kanoff is a 54-year-old professional wardrobe stylist and style blogger in the Greater Boston area and author of the blog, TheMidlifeFashionista.com. 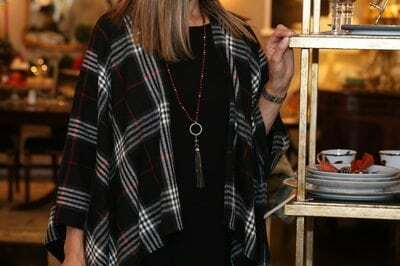 Susan’s motto is “Do away with frumpy,” and she does this by giving midlife women fresh, modern and easy-to-wear style inspiration. Susan’s been featured on television and in print publications. She’s known for her work empowering women through her passion for clothes. I love wearing capes especially during this time of the year.